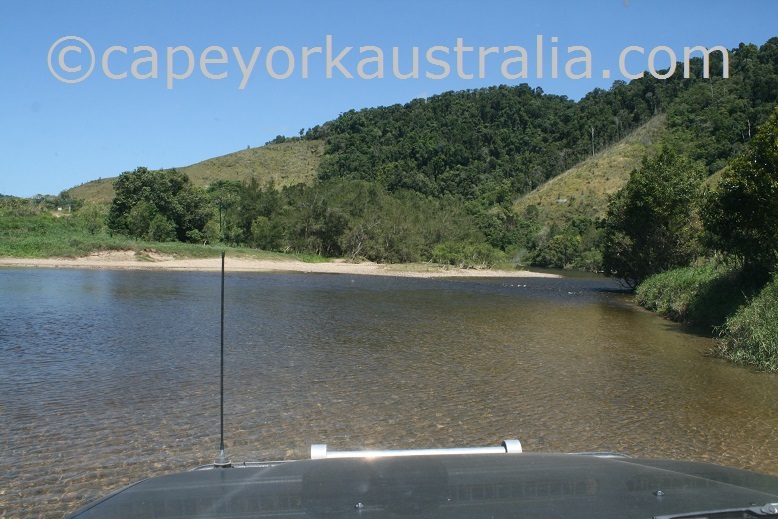 Crossing creeks and rivers is the best fun on a Cape York trip. 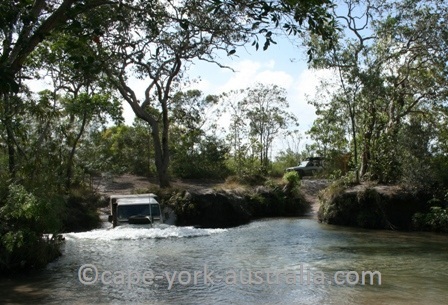 While there are surely some harder four wheel drive tracks elsewhere in Australia, the northern parts of the country, and particularly Cape York, definitely have more of the wet crossings than does southern Australia. 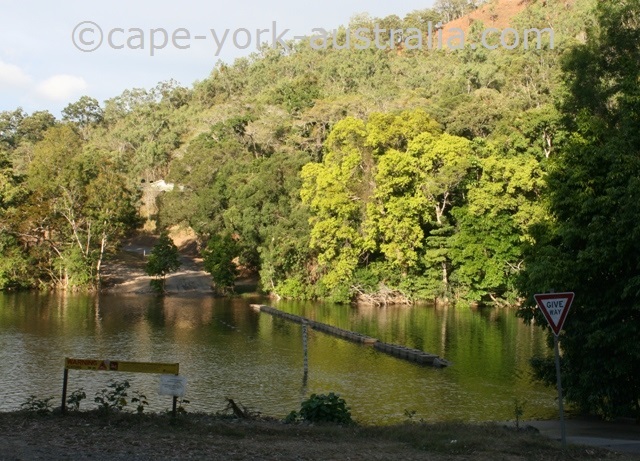 It is part of the reason why Cape York is the most popular four wheel drive destination in Australia, and it makes great photos and videos, so don't forget to bring both cameras! There are plenty of creeks and rivers to cross, but the ones along the main roads are mostly dry during the Dry Season. The Old Telegraph Track is the most famous and most obvious place. In the early Dry Season it is a lot wetter, but in the middle of the Dry when most people travel up here, the wet crossings still include Dulhunty River, Bertie Creek, Cholmondeley Creek, Gunshot Creek, Cockatoo Creek, Canal Creek, Sam Creek, Mistake Creek, Cannibal Creek, Logans Creek, and finally the infamous Nolan's Brook that claims the highest numbers of vehicles. Frenchmans Road is another famous adventurous road on the peninsula. It is a shortcut from Telegraph Road to the main road to Lockhart River (as well as Portlands Roads and Iron Range National Park). Both can be adventurous in rainy weather, but Frenchmans is whether it's been rainy or not. It crosses two rivers - Wenlock and Pascoe. Wenlock is easy, even though it does have a steep entrance. Pascoe is one of the hardest crossings on the whole peninsula. It has steep banks, and also after having crossed so many creeks, you sure notice that this one is a river - it's deeper, and has more current. Crossing rivers - Pascoe on Frenchmans. (That said, describing crossings can be just as misleading as describing roads because it really depends a lot on recent weather). 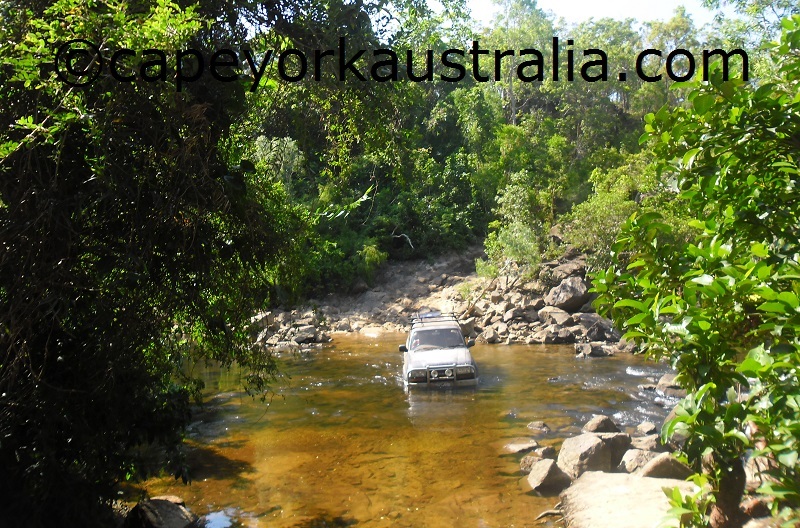 The main road into Lockhart River is a larger road and generally not a problem, but it can have its surprises. 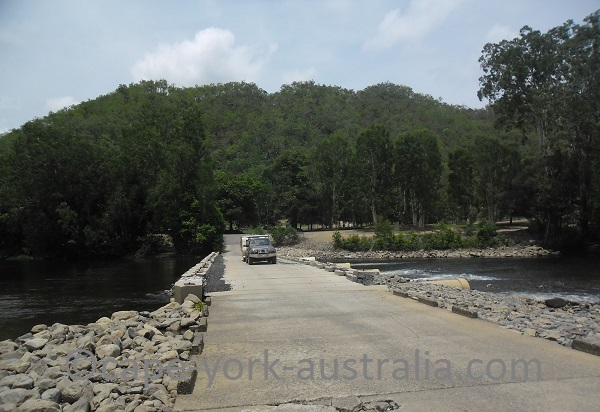 While it also crosses Wenlock and Pascoe Rivers, on this road both river crossings are easy. However, north of the rivers there are a few fords, seemingly small and easy until you have a heavy rain. Crossing creeks - stuck at the ford. 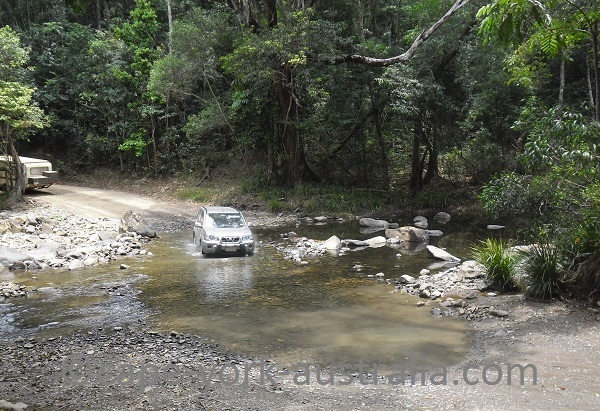 The third area with some good crossings is between Daintree and Cooktown. The coastal one is the "infamous" Bloomfield Road (which really is a reasonable gravel road and not a challenging track), and west of it is CREB Track, which indeed is a narrow, at times steep four wheel drive track. Crossing Daintree River on CREB Track. 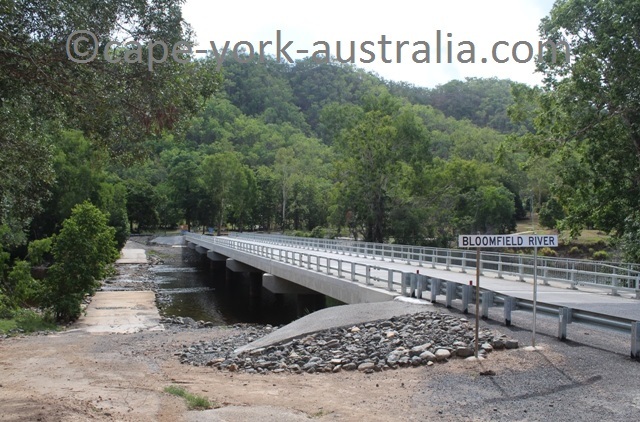 It starts in Daintree Village and ends near Bloomfield Falls in Wujal Wujal. 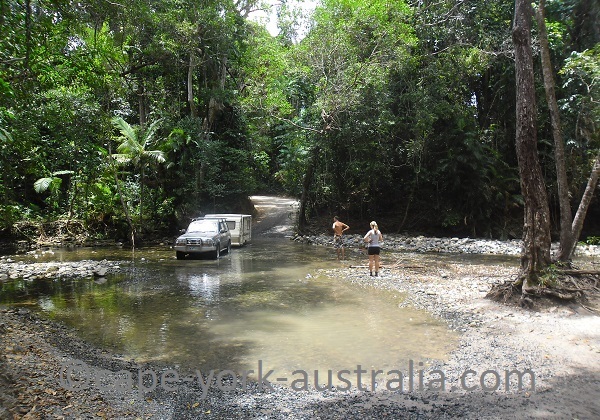 First you cross Daintree River and further north there are a few creek crossings. All are easy in the good weather, but this track is particularly sensitive for rain - which is why it so often gets closed after rainfall. Shallow crossings on Bloomfield Road. Bloomfield Road on the other hand is broader, it is a reasonable gravel road and while it is true that it is steep in parts, we have even pulled a caravan through. We did use 4WD to maintain traction on the steep slopes but only because of the weight of the van. 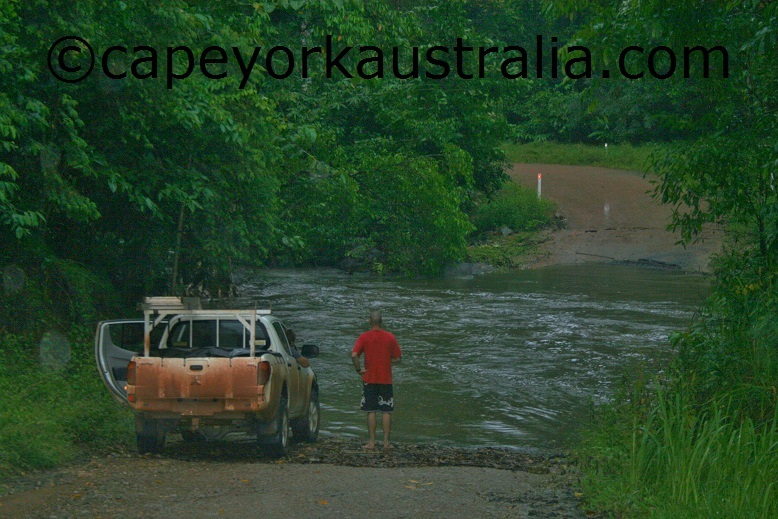 There are a few small creek crossings, but in the middle and towards the end of the Dry Season these are very shallow - you hardly get your wheels wet. Pulling the van through Bloomfield. Crossing the Bloomfield River on causeway. ... on others there has been water over it. Bloomfield River crossing under the water. The old causeway can still be seen on the left hand side.